Karina's Kreations: Bells and Boughs Beauty! I originally received this card as a swap but can't remember who it was from. I loved the design and all I did was change the colors of the card. I used Sahara Sand, Cherry Cobbler & Always Artichoke card stock. There is a bit of a trick to this card. The image was stamped on Vellum card stock with Jet Black Stazon Ink. The image was then flipped over and colored with Cherry Cobbler & Always Artichoke Stampin' Write Markers. The card stock was laid on the sponge layer of the Mat pack and the veins of leaves were traced with a stylus. 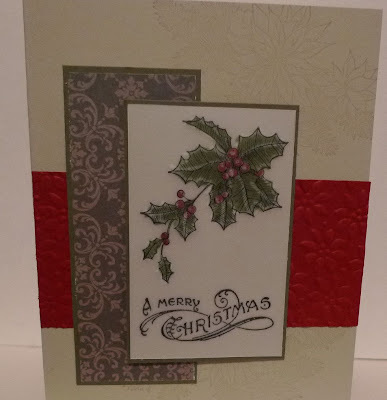 It created a white dry embossed look when the Vellum card stock was turned around. The vellum was secured to Sahara Sand card stock with a mini glue dot. It's a really fun technique.